We all have favorite phone apps to run our business, interact with friends and family, or entertain us. But if you are on the Android system it can sometimes be painful when you can’t use your phone and need or want to use that app. Bluestacks runs an Android emulator right on your PC or Mac! Quite simply, Bluestacks runs an Android emulator on your computer by basically creating a new phone on your computer. You set it up like a new phone or tablet with your Google account, you get access to the Google Play store, and you install the apps you wish to use. Why Would I Use An Emulator Instead of My Phone? So why would you use an Android emulator instead of just pulling the phone out of you pocket or purse and using that? Your favorite apps may not be available in the Windows or Apple stores, or in the Chrome Extensions. Many favorite apps are available in online versions through the browser, but if you have many tabs open at one, it’s easy to lose track of what’s there and close it by accident or lose information when the browser crashes. Some workplaces simply frown, discourage, or completely refuse to allow the use of smartphones in the office. In multiple monitor uses it allows the Bluestacks app to be placed in a position outside the typical email and web browser locations. First all, if you’ve ever used an Android tablet, it looks and works very similar to that. The interface has large, easy to click/touch shortcuts. Bluestacks will work with both touch screen and a mouse/keyboard so don’t think you need a touchscreen computer to work the app. Each app will open in their own tab, and music and other media will play unless the “System App” folder is opened to change settings, visit the Google Play store and other maintenance items. There is a small big of lag noticeable, but compared to virtual Windows boxes or other emulators, Bluestacks run very efficiently. There’s not much noticeable drain on computer resources, but I didn’t test it on a lower-end Windows computer, so there is a possibility of the app not wanting to run efficiently on boxes with low RAM or single-core processors. Remember you ARE running basically another device off your laptop or desktop. One thing I did not like the tendency of some apps to default to portrait mode. I saw this on my Chromebook as well, and there is no way I’ve found to fix this. The portrait mode happens when an app is not designed to work in tablet mode and switches the emulator window to portrait mode to display properly. Most of the time the window goes back to landscape when another app is opened, but I have seen it stay portrait when switching back. Easy answer? Yes! If you’re like me and rely on your smartphone or tablet to handle some tasks like your calendar, task management, time tracking, notes, chat communication and more Bluestack is a great way of handling all of those. I used to listen to podcasts and music, keep Slack open, handle incoming website tickets and view/edit my calendar on my Chromebook and phone. Now my phone sits in my charger and my laptop went back to being a laptop instead of a second primary device. And when I get the urge to play games like the now popular FIFA Soccer, Hungry Shark World during Shark Week, or the always fun Clash of Clans, I can do it on my large computer screen instead of my tiny smartphone. Give Bluestacks a try, and let me know what you think! Disclosure: As member of a pretty cool team of influencing users, I receive mobile devices with line of service from Verizon and will occasionally talk about them in blog posts, social media and podcasts. No additional compensation was provided nor did I promise a positive review. All opinions are my own. By the way, many of us meet every Friday @ 2pm CT on Twitter (#MobileLiving) to discuss mobile phones and how you can use them in your daily lives. Join us! We’re back after a few weeks of traveling, too much work, and an illness thrown in for good measure with episode 66 of the BeBizzy Break Podcast where we discuss the Samsung Galaxy S9 phone and how it compares to the Samsung Note 8 and the Google Pixel 2 XL. Before we get into the main portion of the podcast, I have a few smaller items to talk about; a cautionary tale and two reasons to back up. Cautionary Tale : woman has a computer break down, needs to write an article on her iPhone. Instead of using one of dozens of apps, she instead chooses to write the article on the tiny iPhone keyboard and uses her texting app, thinking when it’s done she can send it and then migrate it to a computer. Being mostly done one evening, she left the app running and went to sleep. The next morning, she picked up the phone, hit the space key, and ERASED everything she had previously written on her article. There is NO WAY to recover that information. Had she used one of the many office or note taking apps available for little or no cost, this would not have been an issue. Backup Reminder One : Was asked by ANOTHER person last week if it’s possible to recover photos lost on a now-defective iPhone. This individual has never turned on their iCloud backups, Google Photos, Dropbox, Carbonite, or anything else, just left them on their phone. Now that the phone is dead there is NO way to recover these treasures without expensive recovery processes which may or may not work. BACK UP YOUR DATA!! Backup Reminder Two : Many of my websites were attacked last week. I knew this by getting warned by the Wordfence app, which notifies me if anyone has a failed login attempt or if any critical files were changed. By using a weekly backup, all I had to do was restore a backup for the sites and change some login info. Had my Samsung S9 phone for about a week and it’s finally time to provide my review, and my comparisons to the Samsung Note 8 and Google Pixel 2 XL. I’m lucky enough to be a member of a pretty cool team of influencing users, I received mobile devices with line of service from Verizon. No additional compensation was provided nor did I promise a positive review. All opinions are my own. By the way, many of us meet every Friday @ 2pm CT on Twitter (#MobileLiving) to discuss mobile phones and how you can use them in your daily lives. Join us! Weight 5.74 oz. 6.67 oz. Compared to the Note 8 and the Pixel 2 XL, the Samsung Galaxy S9 is only 3/4″ of an inch smaller, but boy is it noticeable! Carrying in my front pocket was much less bulky, and holding the phone in my hands was significantly different that the other two giant phones. Typing and some other “business” uses were a bit more difficult with the smaller screen, so if you do a LOT of critical functions like posting to work social media, composing long emails, or maybe even typing notes, the S9+ may be a better option that the S9. If there was one place I saw a drastic difference in the S9 compared to the other two phones it was the battery. I’m a big power user so the more battery I have the better. The S9 only has a 3000mAh battery, but the S9+ has a 3500mAh battery which is more comparable to the Note 8 and Pixel 2 XL. The larger form factor has the benefit for more room, which is largely taken up by the battery. The new Samsung Exynos 9 processor in both of these devices is fast! Boot times, app opening, even page transitions are noticeably quicker than the Note 8 & Pixel 2 XL. There’s some discussion on whether the Exynos 9 is on par with the A10 processor in the Apple iPhone X and tests seem to place it right in between the A10 and the Snapdragon on the other flagship phones. Either way, this is really quick even compared to just the last version of the S-series phones. While the Note 8 still had the standard single speaker on the bottom of the phone which can easily be covered up and muted, the Samsung S9 has some amazing sound quality built in. They are running a surround system with Dolby Atmos technology and plays back great sound even if the exposed speaker is covered by the hand, clothing or other method. It’s not quite as good as the Google Pixel 2 XL, but this is simply because the Pixel 2 has stereo front firing speakers built into the bezel, which costs a little real estate on the screen, but features great sound. I’ve saved the best for last. The Super Speed Dual Pixel camera on the S9 is simply better than the Pixel 2, which as been crowned the best smartphone camera for several months. The Auto function does a great job of selecting the right white balance, exposure and focus. And if you go to the Professional mode, you can get really creative with all of those functions. But on the video side, the Super Slo-Mo camera is really innovative. At 960 frames per second for short burst the super slo-mo camera delivers crystal clear slow motion video. And it didn’t really matter how fast the video was moving. The low-light capture is stunning with no artifacts in the darker sections of the photos. FYI, to open the camera quickly you can double-press the power button. As a phone for personal and light business use, I would have no problem recommending the Samsung Galaxy S9. It’s the fastest phone I’ve ever owned, the screen is great, sound is amazing and the camera is the best smartphone camera available. I’m a bit of fan of the larger form factor, and while I didn’t get a chance to test the S9+, I have held one in a Verizon store and played with it. The form and performance is similar to the Note 8 making typing and other tasks a bit easier for me. Don’t forget to subscribe to the BeBizzy Break Podcast on your digital assistants like Amazon Echo, Google Home and on your podcasting apps like Apple Podcasts, Stitcher Radio or wherever you get your podcast files from, like the PocketCasts app! Have a great easter weekend everyone, stay safe on April fools, and we’ll see you next time on the BeBizzy Break Podcast! Will be getting some equipment from Verizon to review and provide feedback. Initial review is that if you could combine these two phones you would have to perfect smartphone. In early January 2018 Google announced some upcoming changes to the search results that will be presented based on the type of device used to access the search. One of the ranking factors that will be used in presenting mobile results as of July 2018 will be page load speed. In the past, page load was not a high ranking factor for mobile results, so this is a fairly big change. So now is the time to start thinking about redesigning the page, moving to a faster host, or making significant other changes to the page to increase your load speed on your mobile page. Google has already been using page load speed as a primary factor on desktop sites, but will now us speed in determining mobile results. Now Google has stated it will be used more to punish very slow sites by moving them down the page ranks than it will be to lift faster pages, but I expect it to become more significant in ranking mobile results in the near future. So the tip for better mobile results on Google searches is to start planning for a mobile site, get it optimized, get it running on a faster server, and get it indexed by Google and ready for the change in July 2018. Disclosure: As member of a pretty cool team of influencing users, I received mobile devices with line of service from Verizon (#ad). No additional compensation was provided nor did I promise a positive review. All opinions are my own. By the way, we meet every Friday @ 2pm CT on Twitter to discuss mobile phones and how you can use them in your daily lives. Join us! The Pixel 2 XL is the anxously awaited android smartphone from Google. It runs a stock version of Android O(reo), and is loaded with a lot of great features. There have been discussions of screen burn-in, a bluish tint and a few other things. According to TNW, Google plans on releasing a software update soon, and also extending the warranty. In this episode we talk about Android Oreo, Skype, Chromebook Bluetooth issues, Facebook bandwidth limitations and GoDaddy Smartline. New Android version is officially Oreo. Google announced this on during the solar eclipse in New York. Faster, better battery life, better copy and paste, picture in picture. However, I did choose Skype as my inbound/outbound backup. Worst part is now when I get a phone call, my phone, my Chromebook, my iPad and my computer all ring. I finally stopped leaving Skype on all the time on my Chromebook, so that removed one of the devices. Facebook will start distributing files based on the ability of users to view the content due to their bandwidth. This does not mean you should NOT use video or images, it just means you should make sure you take some time to compress or optimize your file before you upload. This will make sure your message, advertising, or video of your dog playing will get seen my more people. BeBizzy Consulting can help you with your social media. Contact us today! Make and receive calls using the Smartline business number. Have a favorite small or home business phone system tip? I’m looking for help! BeBizzy Break Podcast : Episode 48 – Can You Hear Me Now? I am currently having a problem with my phone. A few weeks ago, my mobile phone connection has significantly dropped off in my home office. I’m in a basement with only a small window directly above my head to the outside world. I get nearly no bars on my phone connection, and my 4G LTE is suspect. Technology is sometimes good, sometimes a little sketchy. So let me know what you’re currently using if you are also unable to go exclusively with your smart phone, and we’ll talk about my decision in a future podcast! The Samsung Chromebook Pro launch is the first time in a LONG time I’ve been excited for a new piece of technology. Sure, there’s the fun of unboxing a new smartphone, laptop or smartwatch. There’s the uncertainty of how a device like Google Home, the Nest family of devices or even a Bluetooth speaker will work or sound. But nothing is comparing to the restlessness I’ve been experiencing waiting for the Samsung Chromebook Pro to arrive. The Chromebook Pro got announced back in February 2017 along with a Chromebook Plus. They are essentially the same device, with a better processor and a fancy black color for the Plus… and $100 more. The Plus came out as expected in March, but the Pro was given a soft launch of “April 2017.” April came and went, articles went up blasting Samsung for missing the launch… then most of May went by. Finally, Samsung announced it would be selling the device online at Amazon, Best Buy and a few other online locations on May 28, 2017. Of course, by the time I looked at Amazon it was gone and none of the other places even had it listed on their sites. So I waited, and waited, and waited… until it surfaced (see what I did there?) on BestBuy.com for the promised price of $549. I couldn’t purchase it fast enough, and thought it would be delivered in time for the weekend, which didn’t happen. So I waited some more… and then all day Monday until it finally showed up around 4:30pm! So I used it the rest of the day, and even typed this review on the Chromebook Pro the next day, and here’s what I found. Thinking about purchasing the Samsung Chromebook Pro? Here’s some reasons why you should! Weight – Not the other wait; that was bad. But this thing is LIGHT! With the Chromebook Pro I’m replacing a Samsung Galaxy Note 10.1 tablet and an Asus TP300L laptop. Both were noticeably heavier (especially with a case on the Note 10.1) and much bulkier than the Chromebook Pro. 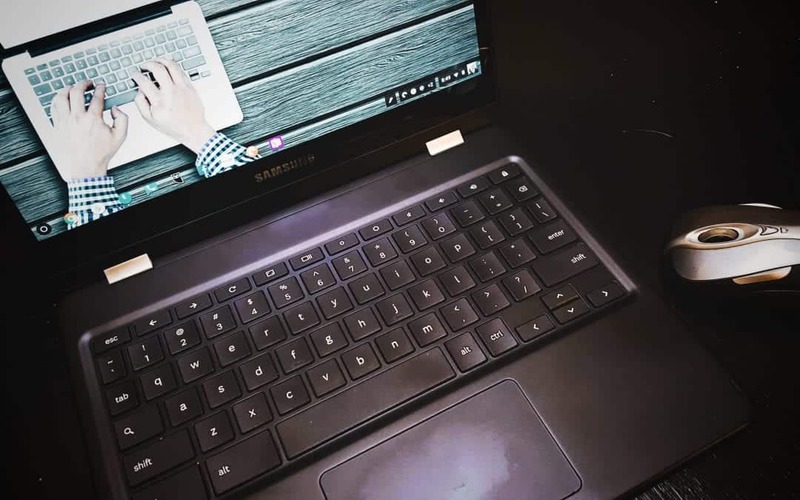 Android Apps on the Chromebook – Probably THE most impressive move forward, and frankly what held it back on the release, is the ability to install and run Android apps on the Chromebook Pro. I love Typemail for email, I use Google Voice and Hangouts for calls and SMS messages, OneNote for notes, and more and instead of having to do everything inside the browser, now I can install apps I’m used to using on my tablet and phone to do these things and more. Battery Life – Samsung claims over 10 hours of battery, but with real use I’m seeing closer to 8. Considering I was getting about 3 on my Asus laptop, and about 6 on the Note 10.1, I’ll take eight hours. On the flip side, the battery charges amazingly fast using the USB-C power adapter. Speed – With only a 2.2gHz processor, I wasn’t expecting the Chromebook Pro to be overly snappy. But no matter how many apps I opened, media I had running, browser windows I had up on Chrome, I never really saw any lag. Screen – The screen is incredibly bright, incredibly clear and even with small text, incredibly crisp. It is a little weird with the 4:3 ratio instead of the now-common 16:9, but that took moments to get used to. The bezel around the screen was slightly larger than I expected with Samsung’s journey into infinity screens on their S8 phones, but with the black case is less noticeable than with a silver or grey case. Convertible Screen – The screen flips around a full 360 degrees to convert the Chromebook to a full Android tablet. Reading books, Texture magazines, websites and other media was a great experience, and watching video had stunning video, ok audio (fixed with earbuds), but did lose a little with the 4:3 ratio (see below). S-Pen – Apple has then Pencil, Microsoft has their Surface Pen, but the S-Pen available for not taking and drawing on Samsung devices is still the best electronic pen that I’ve used. Some of the features on the Chromebook Pro are not spectacular, but not a big deal in my mind. Below are a few things that probably won’t either move you in one direction or the other if you’re thinking about purchasing the Pro. Keyboard Size – The keyboard is a bit small, but the keys have decent travel and everything is there, although the backspace key is slightly undersized and if you like to “scream” on social media, there’s no dedicated caps lock. Ports – The only available ports on the device are two USB-C connectors, a headphone jack, and a micro-SD card reader. So if you’re the type that connects multiple devices you will need a USB-C to USB hub. Personally I connect through BT or WI-FI in most cases, so not a bid deal. Speakers – There was a lot of discussion of the speakers located under the case and the sound not being very loud. I am either using external speakers or earbuds, so for me, again not a big deal. If you are serious about your sound on mobile devices, I still suggest a BT speaker. Fingerprints and Other Marks – The black case looks great, but it does get a little marked up easily, and of course the touch screen can hold fingerprints so keep it clean! Apps Resizing – Not all Android apps are able to be resized and some are limited to phone size only. I’m currently looking for a way to install tablet version of some of my favorite apps like Scribblepost and others, but for now I’ll just use the browser version. Looking for a reason to NOT buy the Chromebook Pro? Here’s a couple that will hopefully be addressed shortly and become a totally non-issue. Apps Not Recognizing SD Card – I’m a mobile DJ, I listen to lots of podcasts, and as a website programmer I like to have the ability to backup and retrieve website files on storage devices. So when I found out that my apps couldn’t find the SD card to play music, podcasts and even my Dropbox folder, I was a little put off. I’m sure it will get fixed, but with only 32GB of onboard memory, it seems a little odd for the device not to recognize the SD as acceptable storage. 32GB of Onboard Memory – Considering my first Windows desktop had a “massive” 2GB HDD it seems odd to complain the Chromebook Pro only has 32GB of onboard space. When apps start natively seeing the 128GB SD card I have in the device this will be a totally non-issue, but as it stands now I’m not a fan of the smaller hard drive. Reports of Apps Crashing – There are some reports of the Chromebook Pro crashing when a fair amount of apps and browser windows are active. I have not seen this, in fact, as I type this post I have 10+ browser windows open, TypeMail, OneNote, PocketCasts (playing a podcast), Hootsuite and one more app running with no issues. If it becomes more common for apps to crash the device this is a very real issue, but for me it’s not. I plan on using the Samsung Chromebook Pro as my daily machine for a few days, with the exception of recording my podcast and maybe a few other things. So as I find more benefits and issues I will make sure to document them here. Thinking about purchasing the Chromebook Pro? It’s listed on Amazon here for the standard price of $549 (same everywhere else), but at the time of this post was sold out. I’m sure more are on the way. Looking to save a few bucks but get many of the same benefits minus some computing power? Try the Samsung Chromebook Plus for $449.